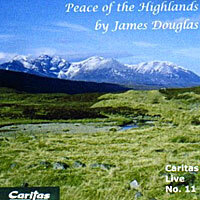 This beautiful new CD (launched 6th July 2007), is now available online. Featuring a wide selection of the music of Scottish-based Composer James Douglas, all taken from his magnificent Sequence: ‘The Highlands and Islands Sequence…including 66 works written for the Highlands and Islands from 1968 until 2006. This CD includes much music dedicated to and written for the people and the visitors to North West Scotland and is a special treat for all music lovers alike. The CD shows a stunning photograph of ‘An Teallach’ in North West Scotland.